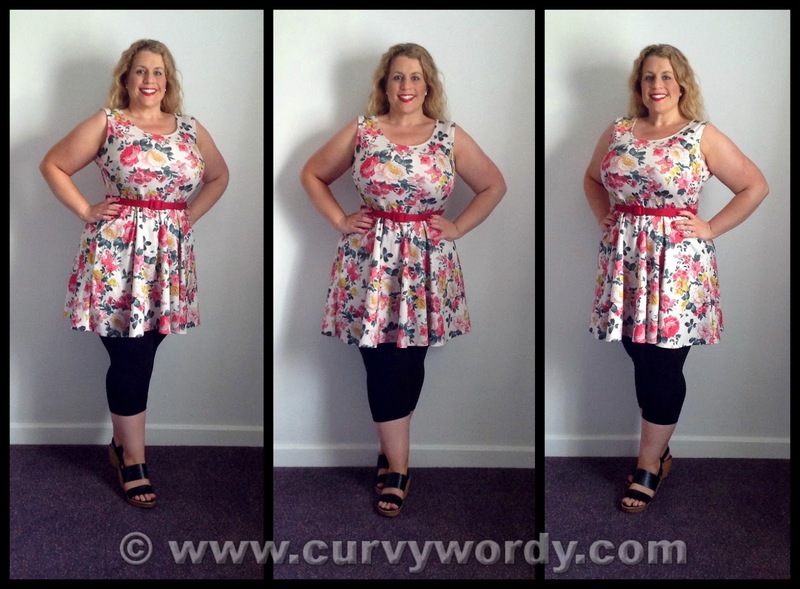 I’ve got a real love for floral dresses so I’m absolutely delighted that they’re all the rage at the moment. What could be better than a dress emblazoned with flowers in an array of gorgeous colours? Some might say leopard print, or polka dots, or stripes, or aztec print, and so on…I love all of those too, but florals more often that not are the prints that really jump out at me. I’ve reviewed a number of plus size clothing brand Pink Clove‘s items over the past few months on my blog; some of which I’ve purchased myself and some of which I’ve been sent by the lovely PR team. Today’s review is of a dress I bought myself – and I’m very glad I managed to snap this one up as it’s now, sadly, out of stock. 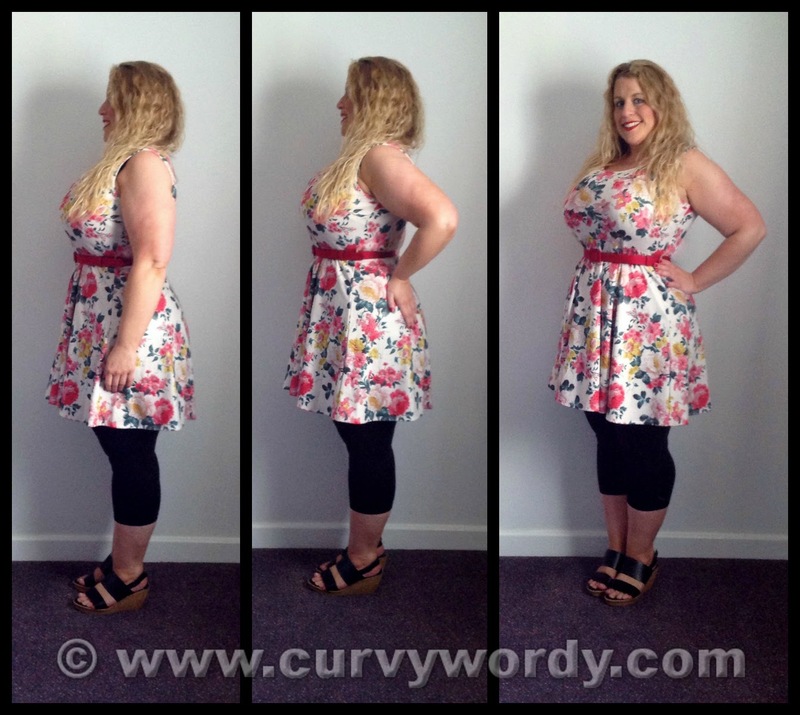 The dress I’m reviewing today is the Pink Clove Bold Bloom Skater Dress (£26, UK sizes 16-32). Isn’t it a beauty? Now, my preference is usually for blues, teals, turquoises, and sometimes reds, so admittedly the pale pink and yellow range of colours featured on this dress weren’t typically my first choice. But as I was placing an order with Pink Clove for some other items so I decided to throw one of these dresses in my basket just to give it a try. 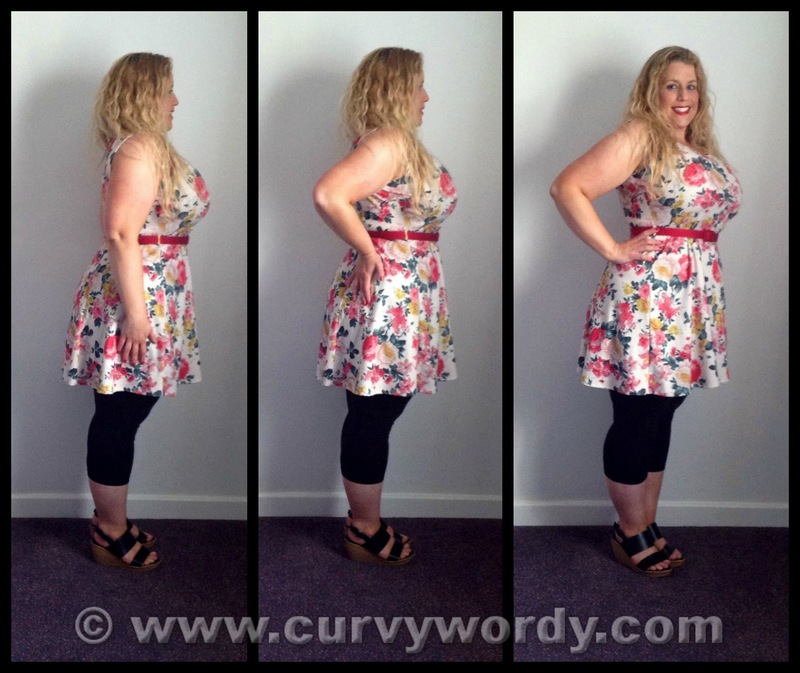 I initially tried the size 16, as this is the size I’ve found works best for me in Pink Clove’s tartan skater dresses. However, although the fabric of the Bold Bloom Skater Dress is stretchy (96% polyester, 4% elastane), it’s not as stretchy as the fabric of the tartan dresses, so I returned the 16 and ordered an 18 instead. Yes, the 18 is much too big for me on the waist, but that’s easily fixed with a belt, and the larger size looks and feels SO much better on my bust. The print is sooooo pretty in real life. I absolutely love it and I’m so glad I took the plunge and ordered it. I suppose it’s quite an old fashioned floral print but maybe that’s why I like it so much! It’s not been modernised, it’s not been changed; it’s just a simple and straightforward flowery design, a bit like curtains you might have found in your grandparents’ house when you were young. The background is cream as opposed to white, and again this is something I like because white can sometimes look too crisp. The pink, red, and yellow flowers are very pretty and the splashes of green from the leaves and foliage do well to break up what could have otherwise been a rather sickly sweet print. The range of colours means that it’s great fun to pick matching items to complete the outfit. The dress is supplied with its own brown belt, as can be seen from the stock photos. I feel brown was a peculiar choice, especially when there are so many pretty colours in the dress that could have been highlighted with a matching belt. Also, there is no brown in the dress at all! I’m supposing that brown and black belts are the cheapest option, and if that means the dress is a little cheaper then you won’t hear me complaining. 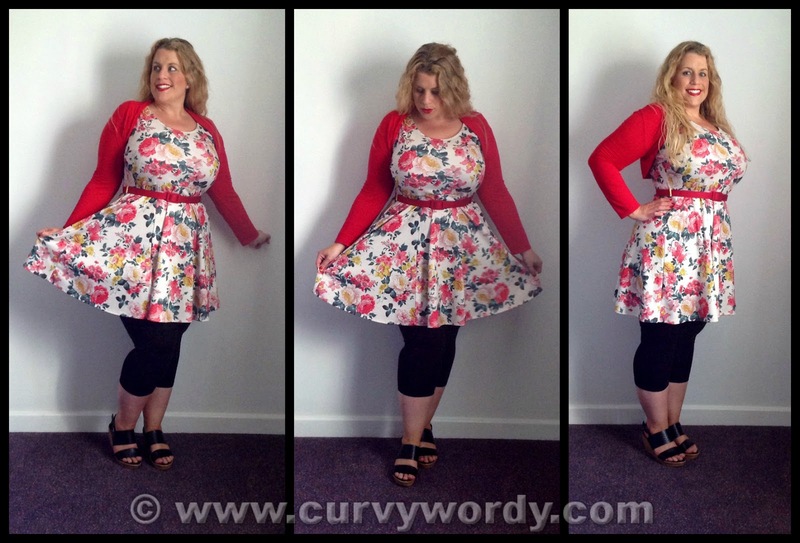 I abandoned the brown belt immediately and replaced it with a red belt from one of my Pinup Girl Clothing Heidi dresses – these belts are slightly wider than a standard skinny belt and they have sliders rather than buckles, meaning that you can wear the belt as tightly or as loosely as you wish. The deep red of the belt picks out the red in the dress, which is mostly a lighter shade but still works very well. It also highlights my waist, so I’m happy with that! I love how the red of the shrug makes the colours in the dress look even more vibrant! One thing I’m not a fan of is the length of this dress. Skater dresses tend to be on the short side and this one is no exception. It’s not super short but if you’re a regular reader of my blog you’ll know that I have a strong preference for keeping my knees covered whenever possible. Thankfully leggings save the day; ideally I’d wear some in cream or perhaps beige, but when I took these photos I only had black ones with me so I opted for these cropped leggings from Forever 21+ (sadly I can’t find these on the Forever 21 website, but I bought them in the Westfield Stratford store in London). They’re only £4 a pair, fit like a dream (these are a 1X), and are super comfortable in the crazily warm and humid weather we’ve had in the UK recently. I normally wouldn’t stray from my much loved Maidenform Flexees leggings but when the temperatures go through the roof there comes a point when they are just too thick to wear. Also, with a flared skirt there is no need to wear shapewear to smoothe, so it’s the perfect opportunity to wear regular leggings. I’ve struggled in the past to find leggings that fit my waist and my hips and thighs, but these Forever 21+ beauties are as perfect as I think I’ll ever get. The waist is a good fit if a little roomy, but the thing I like most is the rise of these leggings. So many leggings don’t come up high enough – I want to put my leggings on in the morning and not have to adjust them throughout the day because they keep feeling like they’re falling down. These leggings most definitely tick that box. They stay in place and require no adjustment – heaven! They are also the ideal length for me as I like my calves covered, as I fear that anything shorter will ride up. Please, please, Forever 21, make these leggings in lots of different colours! My wedge sandals are called Melissa from Evans and they come in four options: plain black, plain royal blue, black ‘jewelled’, and silver ‘jewelled’ (these two jewelled versions are called ‘Maya’ but they are the same as Melissa, and they are currently in the sale!). I love these sandals as they are so comfortable to wear but also they look good. The two plain versions are leather, so they feel very soft on your feet. I find these run a bit small in length: I need a 6EEE, whereas I’m more often a size 5 in sandals. I wish Evans made half sizes as – apart from these sandals – I often find the 5 is too small and the 6 too big! So I seem to have done pretty well with this dress that I wasn’t even sure about to begin with! I have worn and washed it a number of times and am pleased to report that it’s held up well overall. It bobbled on the bust because of my car seatbelt, but that was quickly sorted by running a razor over the affected area a few times. And when I last washed it yesterday I noticed there was some bobbling under the arms so I will have to set to with the razor again. 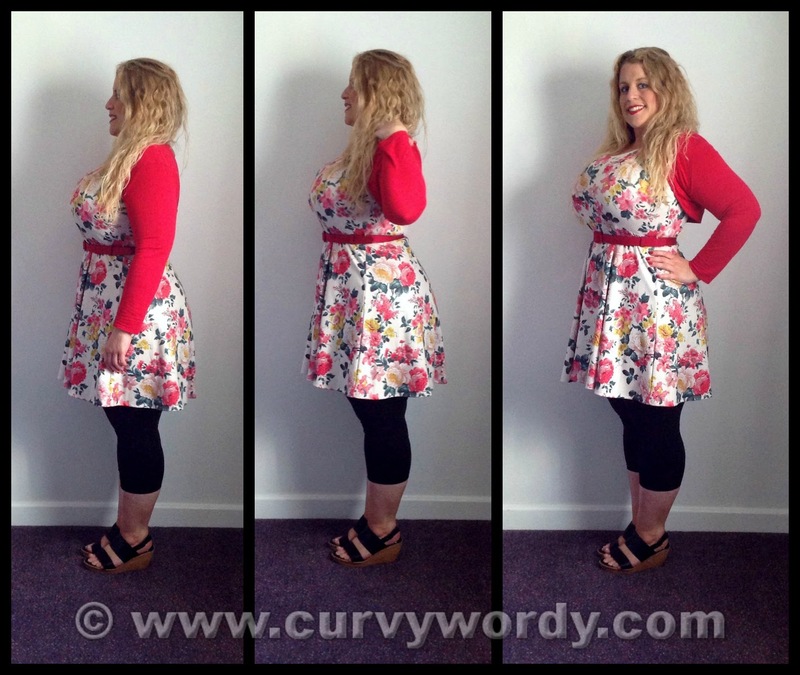 I can’t complain – the Pink Clove Bold Bloom Skater Dress was just £26 and it has already been worn by me more than 10 times. I’d love to see this print with a black background and vibrant blue, turquoise, and purple flowers! Do you like floral prints? What designs would you like to see from Pink Clove in the future? I wish I had known about this dress when it was still in stock. I love it and it looks so good on you. I wonder if one of these might crop up on Ebay one day? I will be keeping an eye out for one as it is so lovely. The perfect summer dress.